Antiis Comics Presents is an all encompassing title that holds the entire Antiisverse. The title will rotating heroes and stories told in three issue arcs, one shots and shorts culminating in Universe wide event at the end of every phase. 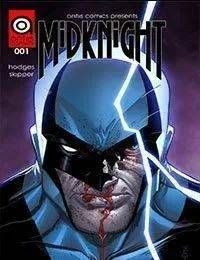 The first three issues will focus on Midknight, previously seen in the pages of Red 5 Comics, Midknights story has been forwarded 10 years, where life is much different then is was last we saw him.